China’s PLA “sunk” a U.S. aircraft carrier during a war game in remote China using its DF-21D “Carrier Killer” missile, reports Taiwan paper Want China Times. The China Times is a 63 year old Taiwanese paper slightly slanted toward unification, but with a solid reputation and accurate reporting. The Times report originates with a Google Earth image published at SAORBOATS Argentinian internet forum. The photo shows two big craters on a 600 foot platform deep in China’s Gobi desert that Chinese military testers used to simulate the flight deck of an aircraft carrier. There has been talk of the DF-21 for years with estimates of its range, threat, and theater changing implications, but this could be the first known test of the rocket. 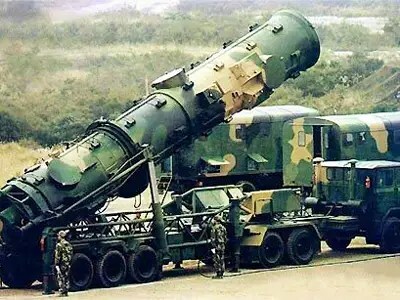 The Dong-Feng-21D ballistic missile is expected to ring China’s coast on its truck-mounted launcher, posing a significant threat to U.S. Naval forces in the region. The 21D is particularly deadly in that it streaks to the atmosphere guided by satellites and possibly GPS enabled drones, and then drops faster than sound straight down on its target. Lacking a horizontal flight path could make it much more difficult to defend against and with the Navy’s new carrier’s running at $13 billion plus per ship, losing one would be as great a financial blow as it would be psychological and tactical. But Defense analyst Roger Cliff points out to The Diplomat that the DF-21 faces a greater challenge than what it faced in the Gobi. Read more: China’s PLA “sunk” a U.S. aircraft carrier during a war game in remote China using its DF-21D “Carrier Killer” missile, reports Taiwan paper Want China Times.The China Times is a 63 year old Taiwanese paper slightly slanted toward unification, but with a solid reputation and accurate reporting. Lacking a horizontal flight path could make it much more difficult to defend against and with the Navy’s new carrier’s running at $13 billion plus per ship, losing one would be as great a financial blow as it would be psychological and tactical.But Defense analyst Roger Cliff points out to The Diplomat that the DF-21 faces a greater challenge than what it faced in the Gobi.